May 1, 2007: Sunny and warm, Water temp 72* and clear. Got on the water a 5am and collected bait. Picked clients up at High Point and ran uplake . Set out a spread of 10 boards, a bobber and 2 downlines and pulled a 15' flat. It was a full moon last night and when there are no clouds at night on a full moon the fish gorge themselves in the twilight . I marked schools of fish but as usual on this moon they were not very aggressive, just rolling the baits on the surface and hitting the baits in the tails. We had 8 or 10 hits that way before we had a hook up. It was fun to see the fish boil on the baits but I knew it would be a few hours before the fish would cooperate. We continued to work the 15 to 20 foot depths until the fish got serious, and they did. 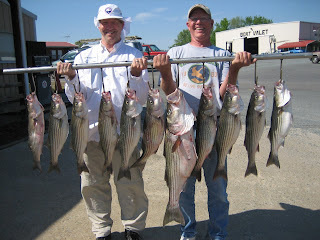 We had over 40 hits today with Chuck nailing a 16.9 pounder and clients keeping 11 Stripers to take home. 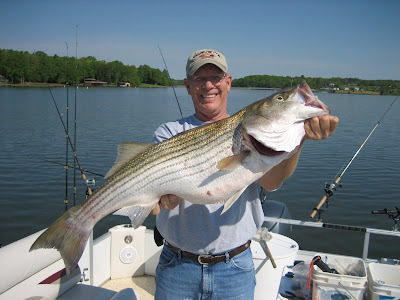 The large fish was 34" long.